Mexico is home to six of the world’s seven species of marine turtles, all of which are on the international Red List of endangered or critically endangered species. The beaches along Mexico’s Pacific coast, those in the north-east state of Tamaulipas, and those in Quintana Roo on the Caribbean, are among the world’s most important breeding grounds for marine turtles. These turtles spend almost all their life at sea, but mature females come ashore in late summer and fall to burrow into the warm sand and lay their eggs. On the Pacific coast, it is estimated that about 40% of these eggs will be stolen by wildlife poachers. When the remaining eggs eventually hatch six to eight weeks later, the baby turtles then stagger towards the relative safety of the ocean, hoping to avoid not only human poachers, but also predators such as crabs, iguanas and birds. Less than one in one hundred hatchlings will survive the fifteen or twenty years required to reach maturity. The three turtle species most commonly found along the Pacific coast are the Olive Ridley or golfina (Lepidochelys olivacea), the Leatherback or laúd (Dermochelys coriacea) and the Green Turtle or tortuga verde (Chelonia mydas). The Olive Ridley is relatively small in size with a narrow head. Its numbers are now recovering on the Nayarit and Jalisco coasts. 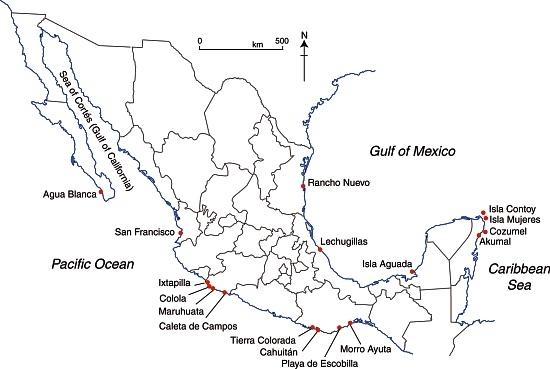 Important nesting sites for the Olive Ridley include Caleta de Campos and Ixtapilla (both in Michoacán), and Playa de Escobilla and Morro Ayuta (both in Oaxaca). About 23.3 million baby turtles were born in the 1.2 million Olive Ridley nests recorded in the 2010-2011 turtle nesting season. Leatherbacks, the world’s largest turtles, undergo amazing migrations, regularly crossing from one side of the Pacific to the other. Their numbers are in serious decliine. In 2010-2011, 15,400 baby Leatherbacks emerged from the 615 nests recorded. (Mexico is thought to have about 1,600 Leatherback nests in total.) Important nesting sites include beaches in Guerrero, Michoacán and Oaxaca. However, in the last-named state, the number of eggs laid has declined by about 20% a year over the last decade. Selected marine turtle nesting beaches in Mexico. Copyright 2012 Geo-Mexico; all rights reserved. Green Turtles are an endemic species and their preferred nesting sites include Colola in Michaocán. The three remaining species are the Kemp’s Ridley or lora (Lepidochelys kempii), the Loggerhead or caguama (Caretta caretta) and the Hawksbill or carey (Eretmochelys imbricata). The Kemp’s Ridley is an endemic species and the only marine turtle to nest exclusively during daytime. Its most important nesting site is Rancho Nuevo, in Tamaulipas. While the numbers of Kemp’s Ridley at Rancho Nuevo fell from an estimated 40,000 or so in 1947 to about 5,000, this species appears to be well on its way to recovery. In 2010-2011, 20,574 Kemp’s Ridley nests were laid in Tamaulipas and an additional 534 in Veracruz, which produced a combined 18.9 million hatchlings. The Loggerhead is found on both sides of Mexico, while the Hawksbill, smaller than the other species, is most common on Mexico’s Caribbean coast, though it can also be found, much more rarely, on the Gulf and Pacific coasts. Mexico’s first turtle management program was launched in 1962. In 1990, the government enacted a total ban on the trafficking of all turtles, turtle products and byproducts. Even so, illegal poaching (for meat, eggs or shell) continues to be a problem, especially since successful convictions relating to the capture or trafficking of turtles are rare. It is still possible to buy baby turtles (for pets) and turtle eggs (thought to be an aphrodisiac) on the black market. The most successful strategy to date has been the establishment (since the early 1970s) of turtle protection camps on key beaches. During the egg-laying and hatching season conservation groups led by biologists, with the assistance of volunteers, local fishermen and Mexican navy personnel, guard the nesting sites, sometimes moving nests to better protected areas. This strategy has definitely been successful. For example, over the past few years, the conservation group patrolling San Francisco beach has seen the number of active Olive Ridley nests increase tenfold to 700. However, not all beaches can be protected. In Jalisco, for example, only about 80 km of the state’s 200 km of sandy shores are closely monitored. Protection efforts at 33 nesting beaches are overseen by the National Commission on Natural Protected Areas (Conanp). Of these 33 beaches, 10 are natural protected areas, 3 are in biosphere reserves and 15 are internationally-designated Ramsar wetlands; the remaining 5 have no formal protection status.